Shopclues Diwali Sale #ItneKumMein 1st Oct – 10th October 2016. Shopclues Diwali Sale Offers 2016 – Get ready for exclusive promotional discounts across multiple categories from 01st to 10th October, 2016. 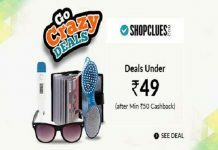 The 10-day promotional sale will enable ShopClues consumers to bask in the typical Indian market-like experience and explore the extensive range of well-curated products and merchandise available on the e-commerce platform across popular categories like consumer electronics, home and kitchen and ethnic fashion. 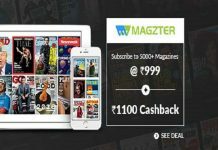 So Hurry up and avail this offer now !! Apply Coupon if you have any. Enter your shipping details/address where you want to deliver your product. Your order is placed now and it will be delivered soon. This Diwali 2016 load up your life with new things in your house, because ShopClues is offering Diwali Sale 2016 to bring you offers each day from 1st – 10th October 2016 to suit your needs. 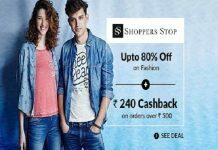 In this Shopclues Diwali sale 2016 you can Get Upto 75% Off cashback available in this sale across all categories. We will update you regarding all ShopClues Diwali Dhamaka deals and offers. Don’t wait to buy that washing machine, laptop or mobile anymore. This Diwali, get rid of the old storage and deck up your home with Shopclues Diwali Sale 2016 offers for grander celebrations. Shopclues Diwali Sale is running from 1st – 10th October 2016 where we will add new deals & coupons everyday. Each day Sales come up differents categories and we will handpick best deals for you and add here !! The financing offer is valid on purchases made till November 15, 2016 with Rs 500 cash-back on the first EMI payment. In order to lure more customers, ShopClues also plans to run a pre-approved sale, where a consumer can get the loan approved instantly and schedule the purchase later as per his/her convenience during the festive season. With a credit limit of up to Rs. two lakh, a customer can use CashCare to buy his/her favorite product from ShopClues and pay over the next few months instead of paying the full price upfront.